Unique invitations, embedded with wildflowers seeds or garden herbs. Made in the USA, with 100% recycled paper & renewable energy! example: Green, Brown, Cream, Black Tie, etc. 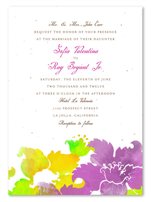 To receive samples, you must list a couple of designs from our website that interest you. Thank you. At ForeverFiances, we love our handmade paper. Its unique weight and feel, its texture and colors, its smell and charm. We love sharing it with others. That's why we always include additional swatches and samples with each sample you order. 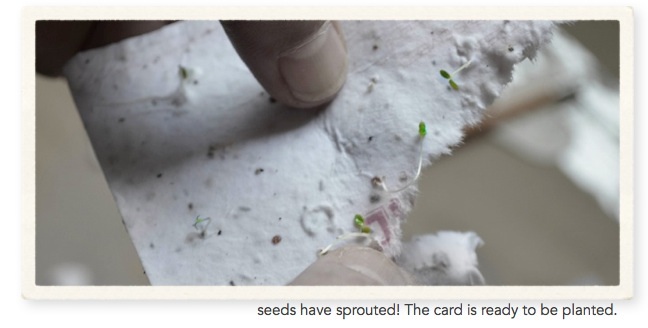 "Everyone was so excited to receive our plantable invitations! I had friends who have never planted a seed in their life promise to buy a pot to plant our invitation. I'm happy and proud to have made an eco-friendly choice to order my invitations from Forever Fiances. My invitations had the feel, expensive look, and thick texture I was looking for--they were perfect!!" 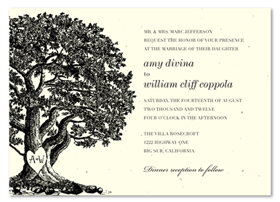 "I ordered the plantable invitations for our upcoming November wedding. So far, the responses from our guests has been overwhelming! They all keep commenting on how unique and beautiful these invites are. As far as my experience with ForeverFiances, A+ across the board. I accidentally forgot to add something to my order, and they made it so easy for me to arrange adding it. The proofs were fast and exactly as I described. I couldn't possibly be any happier! Thank you so much!" Ps: awesome job on packaging using eco-friendly materials! We were so happy to NOT see peanuts!" "The ordering process was easy than I expected. I called customer service and emailed them my design. Tim was very helpful and walked me through all the details that I needed to know about to place my order. I receive the cards within the promising time frame. (about 2 weeks). The printing and paper and design turned out fantastic. Love it!!! My friend would be stoked when they receive the invitation cards. Highly recommend to use Forever Fiances! Just one suggestion, it would be nice to mention "planting instruction could be found on www.foreverfiances.com" as part of the printing on the back." "All the Forever Fiances products we ordered were of excellent quality and so eco-friendly! They have a wide range of choices and even though my wedding colors were a bit unusual they had no problem matching them. Customer service via email and phone was quick and helpful. My only gripe is that their website and ordering process can be a bit confusing, but again customer service quickly cleared up any issues. We researched several eco-friendly options before finally deciding on Forever Fiances for our invites and programs and I'm so glad we chose them. In terms of quality for price these products are definitely a good value." 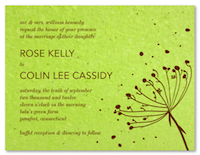 Shop our unique and eco-chic selection of plantable wedding invitations, including green wedding invitations, beach and destination wedding invitations, monogram wedding invitations, garden wedding invitations and tree wedding invitations. Beautiful and unique. Can't wait to order seeded thank you cards! I love using paper that will not wind up in a landfill. The quality of the samples I received is phenomenal. Personalized follow up emails to ensure satisfaction and offer any further assistance were very appreciated and not too frequent or spam like other companies. The samples your company sent me were fantastic! I especially love that you can plant some invitations. I'll definitely be spreading the word around about your products! Love my samples! I ordered 1 sample and receive 5 samples, plus swatches. Super helpful. I ended up choosing another design that I originally thought, because it was so beautiful once printed. Highly recommended. Great company. 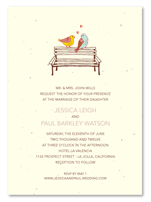 I used your website to order my plantable wedding invitations. I had a couple of questions prior to ordering. The customer service representative was extremely helpful and friendly. Once I ordered my invites, the first proof came in quickly. I made a few changes and the second proof came in. I made one more change and the third proof was sent back to me within 5 minutes of my email to you! My invitations arrived in the mail shortly after I gave my approval on the third proof. I've received many compliments from those who have seen the invitation already. I can't wait to send them out and plant them! Thank you so much for providing me with invites that are eco-conscious and affordable! Much appreciated!